Rock climbing is a fun and physically demanding sport that builds strength, confidence, and focus. It's popular the world over and even when there isn’t a rock face nearby, many cities have indoor climbing gyms with routes that can be as challenging and arduous as their outdoor counterpart. As with most sports, yoga is a great complement to climbing. Continue reading for the yoga poses that can best accompany a climber's training regimen. From bouldering to vertical climbing, you're always using your hands, specifically your fingers, to pull up or across. This strengthens the shoulders, forearms, and the wrists. Padangusthasana requires a pulling action that, while lengthening the lines of the back body, strengthens the forearms and shoulders, and simultaneously helps the fingers understand the action of gripping and pulling. When stepping a foot upwards whilst climbing, you typically require a fair amount of external rotation in the hip. Eka pada rajakapotasana is great for loosening the hips whilst in an external rotation. You can also practice Thread the Needle pose as an alternative or in combination with One-Legged King Pigeon as they both work great in loosening the hips. Maintain each side for roughly 1 to 3 minutes each, focus on the exhalation. Further to the external rotation of the hips needed to bring your foot to the next climbing hold, it is also helpful for the hamstrings and glutes to be strong enough to lift your body from this point. Virabhadrasana II, High Crescent Lunge, and generally any lunge asanas will help with the strengthening of the hamstrings and glutes, particularly when there is attention to actively rooting both feet into the mat, and hugging the heels together towards the mid-line. Having a strong core is key when you're climbing. Let's think of the 'core' as the area between the hips and shoulders. When the core is strong, it helps us to leverage strength throughout the whole body. Ardha navasana or Half Boat pose is an excellent way to strengthen the core giving practitioners a strong trunk. For best results, focus on drawing the tailbone forward between the thighs and drawing the lower ribs towards the navel. 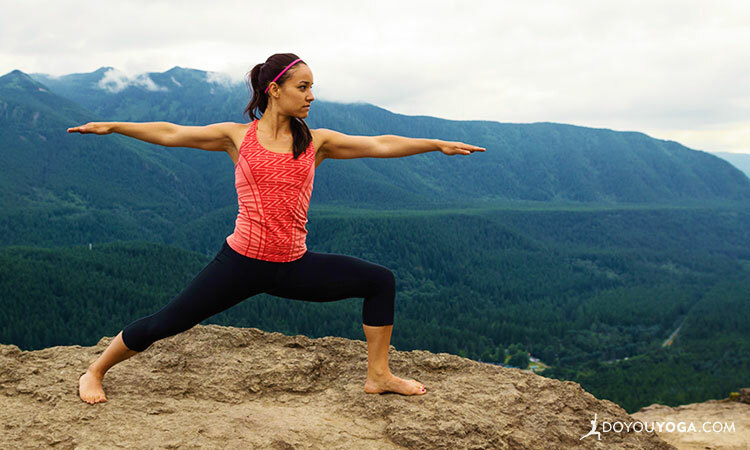 Are you a climber looking to add yoga and asana to your training and workout regimen? Incorporate these four poses to your fitness routine and let me know how it goes!